Question: WGNCA (correlation network): how can I incorporate mutant and wildtype into the same network analysis? 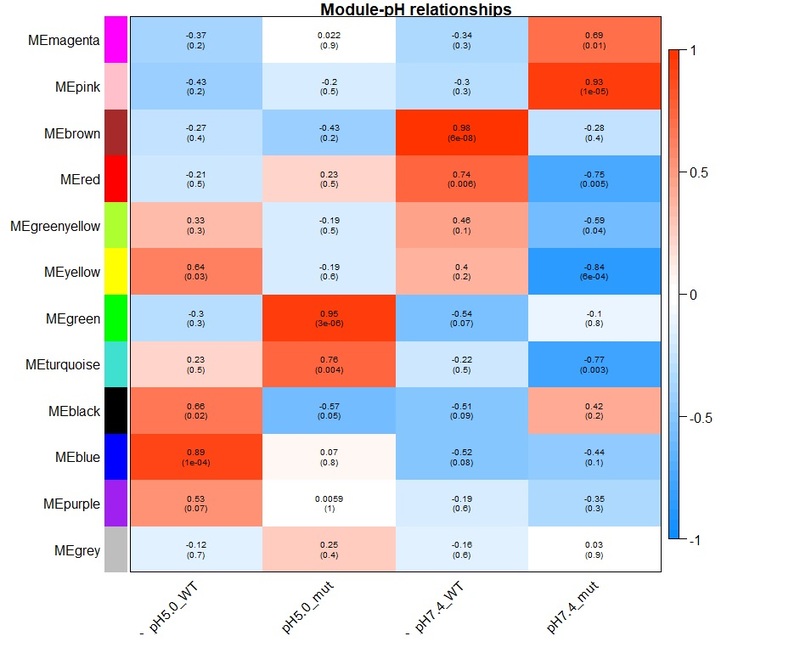 I have RNAseq data set which I looked at the expression profile of a wild-type and gene knockout mutant at two pHs (7.4 and 5.0). I want to identify modules that are associated with pH and genetic background. So for the trait files, I used binary values (0,1) to indicate whether it is that pH and genetic background, for example: pH7.4-WT. Is this the correct way to do it? because I don't actually have a quantitative trait. (Just learnt that the it is recommended to have more at 20 replicates (which I don't have at all), and I suppose the average of these replicates were used instead of like this). Also, tabular data can be displayed much more elegantly when the column command is used well. Surely you mean WGCNA? Shouldn't that be a tag so the question pops up on a tag based search? Thanks for the advice, did change it. Well, at least you have different statistically significant correlations for each group, but what do they mean (?) - take a look at the genes behind each statistically significant module and see if you can infer anything from them. If I had your data, I would honestly be doing other things such as regression modeling - WGCNA would be a final resort.. a bioinformatics equivalent of a 'Hail Mary' pass in the NFL. "such as regression modeling" you had one post which showed regression modelling in biostar , can you provide the link ,i did look but couldn;t find it, as i couldn;t recollect the question you had answered for ..
Annotating bed files with Crosslinking induced truncations sites from iCLIP experiment (chromosome locations).